1. For the truffle butter, whip the butter in the bowl of a stand mixer on a medium speed for 4 minutes. Add the truffle and salt, and mix for a further 30 seconds, or until just combined. Transfer into 6 small dishes or 1 large serving dish. Chill until required (this can be made up to 24 hours ahead). 2. For the damper, preheat the oven to 200°C, gas mark 6. Place the flour, baking powder and salt into a bowl. Grate the cold butter into the dry mix and rub with your fingertips until it resembles fine breadcrumbs. Make a well in the centre. Pour the buttermilk into the well and mix with a butter knife to form a soft dough. Turn out onto a clean kitchen surface and knead until smooth. 3. Lightly grease an 18cm cake tin and line with baking parchment. Make 6 small balls of the dough and place inside the tin working from the centre out. Bake for 25-30 minutes or until golden. 4. 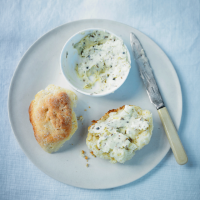 Serve the warm dampers with the truffle butter, topped with extra grated truffle.